I seldom get out of San Diego proper but when I do it is because I usually am on a mission. My mission was to see the “so-called” Banksy mural on the side of a taco shop in Oceanside. This is a great publicity stunt if it is not a real “Banksy”, it took a lot of effort and the rat with glasses looks a lot like the DVD cover of the Oscar nominated “Exit through the Gift Shop” documentary. The DVD gift set even has those same star glasses included in the gift set. The differences between the Rat on the DVD cover and on the Oceanside wall is the reversal in color. The rat is primarily black on the DVD cover with white and on the Oceanside Mural the rat is primarily white with black. Another thing that makes this look like a Banksy is the little pedestrian crossing warning sign turned into a kite. This sign has been tagged before by Banksy as noted on his “official” website. But when I looked at the real pedestrian sign authenticated by Banksy and the one on the Oceanside wall I noticed some detail missing. The mother is not holding hands with the child in the Oceanside mural and in the authenticated pedestrian sign they are. 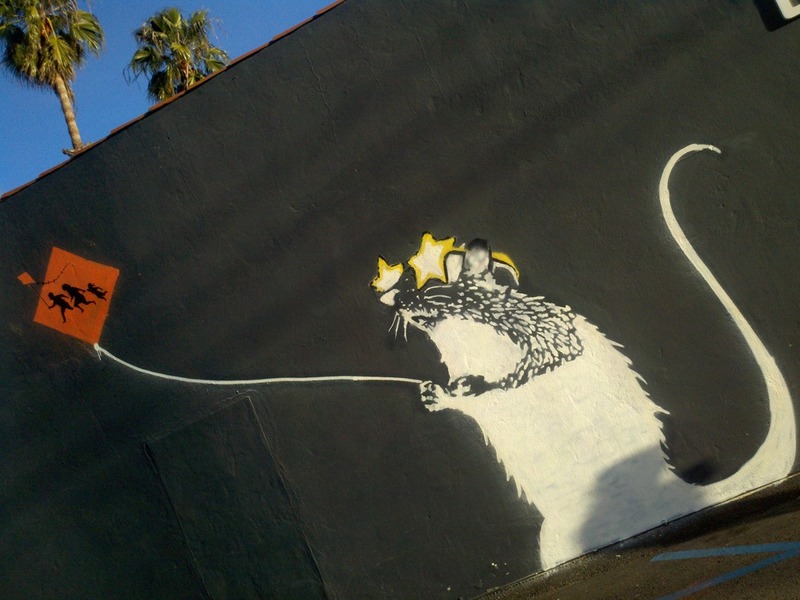 The detail in the rat is slightly off in the Oceanside mural as compared to Banksy’s DVD cover and all of his last pieces. If it does turn out to be a real “Banksy” then I guess Banksy was having an off day. My question is – Why didn’t Banksy tag a message? There is clearly a message about immigration in the sign with the pedestrians crossing but why didn’t Banksy tag a clever line about his view? Anything that is authenticated Banksy will be on this site and so far this Oceanside wall has not shown up. Something else that just did not feel quite right about my “Banksy” experience. There was the guy selling t-shirts near the wall. I suppose it is capitalism at its best. I felt I was at a tourist trap and that is not how art is supposed to make you feel (IMO). I hear the t-shirts were rumored to be selling for $20. I think I may just use that $20 to buy some tacos instead. Banksy if you ever hit San Diego for the first or second time. I think some parts of Downtown would love to see some thoughts from you. UPDATE: The PR Company for Banksy verified that this mural is a fake. The now is was this an inside job? I am not impressed.